The IceMole drill prototype melts into the Blood Falls glacier in Anarctica during a test of technology for a mission to explore Saturn's icy moon Enceladus. The drill collected an uncontaminated water sample from inside the glacier. For the first time, scientists have broken through the icy crust of a glacier in Antarctica and extracted an uncontaminated sample of water trapped beneath the ice for millions of years, potentially paving the way toward the exploration of icy bodies in the solar system. The German Aerospace Center's (DLR) Enceladus Explorer (EnEx) project has been working toward this moment for three years. In 2012, DLR developed a melting probe, or Icemole, meant to someday explore Saturn's moon Enceladus, which hides an entire ocean underneath about 24 miles (39 kilometers) of ice. Scientists drilled through the Blood Falls glacier (seen here) in Antarctica in a test that could pave the way toward a first-of-its-kind mission to drill into the ice shell of Saturn's icy moon Enceladus. 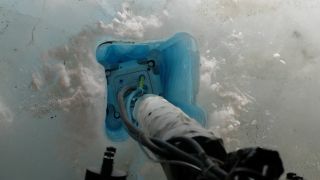 In November 2014, scientists working with the EnEx project noticed sudden changes in three vital signs of the Icemole as it drilled through a glacier in southern Antarctica: The electrical conductivity of meltwater at the instrument's tip increased significantly, the temperature of the melting head increased and the tunneling speed decreased. These changes indicated that the Icemole had broken through the glacier's crust to liquid water underneath, according to DLR. Microbiologists working with the National Science Foundation's Minimally Invasive Direct Glacial Exploration (MIDGE) project were given the go-ahead to analyze the water samples. Scientists hope that organisms within the water, which has been buried underneath ice for millions of years, can improve their understanding of the origins of life, and they want to do the same thing with water samples they someday hope to extract from beneath Enceladus' icy crust. The innovative IceMole drill built for melting through glacier ice on Saturn's icy moon Enceladus is seen on workbench. The tool was used to successfully drill into the Blood Falls glacier in Antarctica during a test run. An entire ocean of liquid water lies under Enceladus' crust of ice, and at the moon's south pole, cryovolcanoes spew jets of icy water into space. When NASA's Cassini spacecraft first flew over the icy spray in 2005, it detected organic compounds that hinted at a possibility of life. But breaking through that crust will be more difficult than breaking through a glacier on Earth. Scientists at the German Aerospace Center say the EnEx Icemole must have a "robust, autonomous navigation process" to ensure the success of a future space mission. "If EnEx is deployed on Enceladus, it will have to find its way from the surface to a water-bearing region in the ice crust of the Saturnian moon completely autonomously," Oliver Funke, project manager at the German Aerospace Center, said in a statement. The Icemole would also have to determine its attitude and position; measure the distance to its target; calculate the optimal path; send data to the surface station via a cable connection; and self-identify obstructions in the ice, such as voids or meteorites, to navigate around them, according to DLR. As the only ice-melting probe of its kind, however, the EnEx Icemole is already on its way to developing that robust navigation system. Scientists have tested acoustic navigation methods based on ultrasound technology and enhanced with motion and rotation sensors as well as instruments that can detect the direction of magnetic fields, DLR added. These navigation methods had good results and will be further developed for the EnEx Icemole.